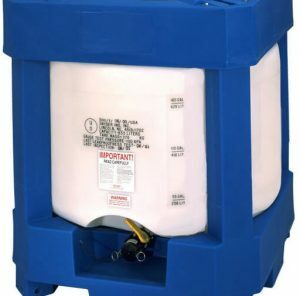 Intermediate bulk containers are DOT/UN approved containers designed for the reusable handling of hazardous, non-hazardous, and food grade bulk liquids, solids, granulated goods, and semi solids. These containers are known commonly as IBC tanks, IBC totes, and simply as IBCs. Certain IBC models are also ideal for blending, distilling, fermentation, and storage applications. IBC tanks ensure cargo security due to their robust design and manufacture. 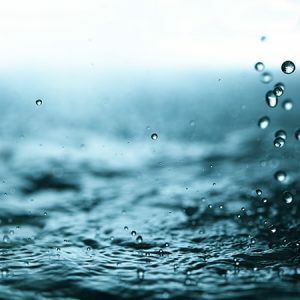 They safeguard internal payloads against potentially damaging external conditions such as water, air, heat, dust, and other general pollutants. Food grade products can maintain hygiene standards. 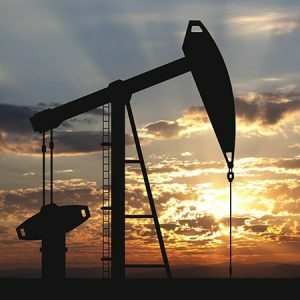 Sensitive chemicals and materials can be safely transported without experiencing corrosion or degradation. Intermediate bulk containers are capable of withstanding various elements including human handling, machine handling, rain, wind, dust, and sea salt corrosion. Our product offerings include caged IBC totes, several high density polyethylene IBC tank models, and stainless steel, carbon steel metal IBCs to fulfill the many needs of the various industries we serve. 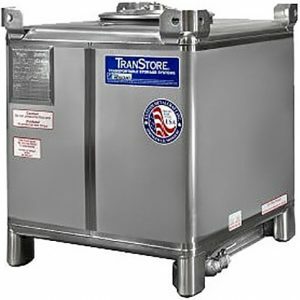 All available IBCs are manufactured utilizing modern technology and are UN/DOT approved per Title 49 CFR for land and offshore transport of Packing Group II and III materials. Carbon and stainless steel metal IBCs are also NFPA 30 section 9.4.1 (1) approved for flammables and combustibles. Common design approvals include UN31HA/Y, UN31H/Y, UN31A/Y. These regulations oversee IBC tote manufacture and uses, making them safe, effective, efficient tools for bulk materials to minimize work efforts as well as employee and public hazards. Tank materials, caps, gaskets, and valves can be manufactured to comply to Title 21 CFRs 177.1520, 177.2600, 178.3297, or 178.2010 upon request. Excluding caged IBCs, all totes have UN/DOT markings permanently integrated to greatly lengthen legibility. IBC tote capacities range from 110 gallons up to 550 gallons. Prices range from $180 to $3,500. Dimensions are as low as 42″ x 48″ x 20″ or as high as 42″ x 48″ x 71″. Materials include polyethylene and steel. 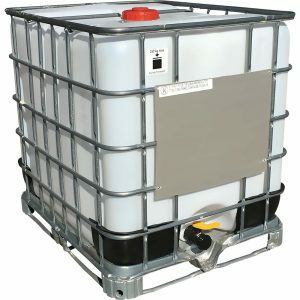 The majority of our IBCs are rated to 1.9 specific gravity (SG), with Excalibur totes offering a 1.35 SG option. 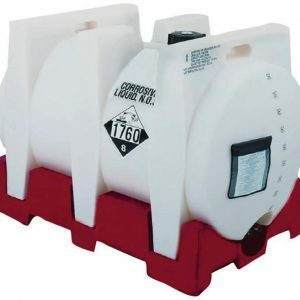 Plastic IBC totes are manufactured from high density virgin polyethylene (HDPE) resin that meets FDA food grade, ANSI / NSF 61 requirements for consumables and potable water. Poly totes includes UV inhibitors to protect against sunlight damage. Metal IBCs are constructed from mild carbon steel or 304/316 stainless steel. IBC Tanks provides the following IBC types: Caged Totes, Standard Square Stackable, Premium Square Stackable, Wide Mouth Square Stackable, Ultratainer, Wide Mouth Ultratainer, Megatainer, Megatainer LX, Excalibur, Stainless Steel, and Carbon Steel Intermediate Bulk Containers. 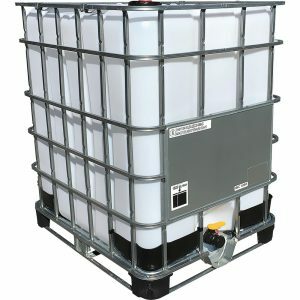 Caged IBC totes are portable plastic tanks contained with an integrated rigid steel frame and pallet. They are available in 275 gallon and 330 gallon capacities with 1.9 specific gravity ratings, suitable for dense, heavy material. Caged IBC totes are blow mold manufactured from HDPE resin that is FDA food grade, ANSI / NSF 61 certified for consumables and potable water. HDPE is an industrial strength, durable plastic that is resistant to the corrosive effects of many chemicals, does not rust, and resists impacts, punctures, and tears. 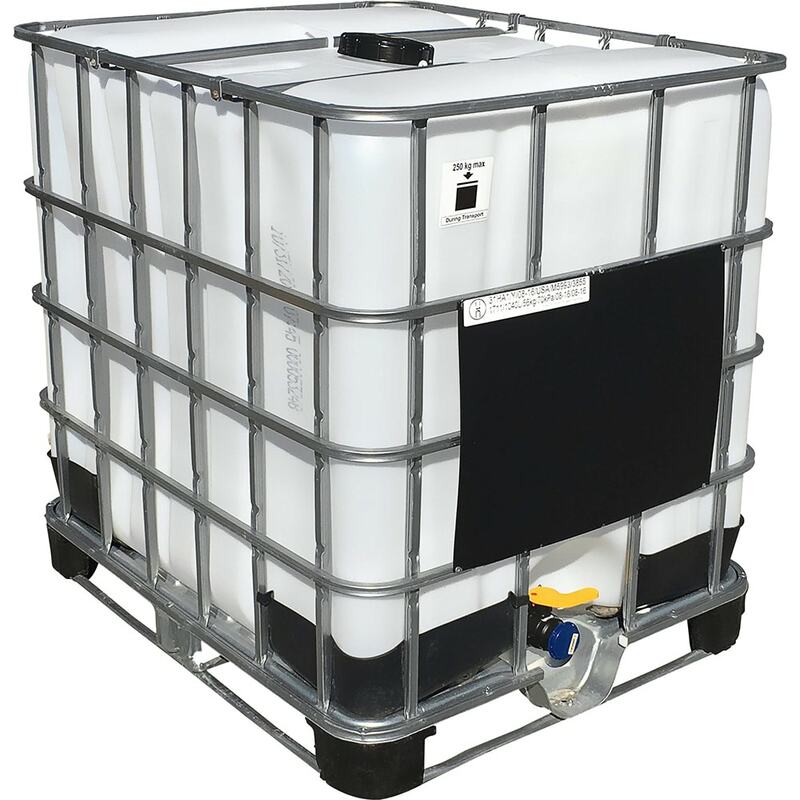 Caged IBC totes are manufactured with walls that are thinner than other HDPE IBCs, making them lighter. See our caged wholesale IBC totes. 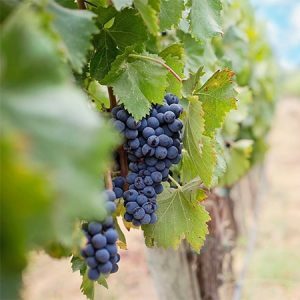 The galvanized steel support and skid provides structural integrity that maintains the internal bottle shape during load stress and protects against physical damages. The integrated pallet features a four way access channel for forklifts and pallet jacks, and allows quick and efficient product mobility. Empty IBCs are stackable to three totes high. 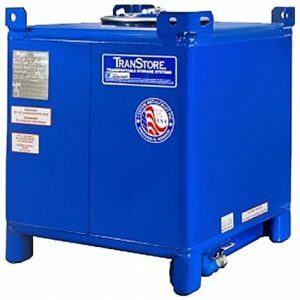 Caged IBC totes are often cheaper, one way, one use transport containers designed for bulk hazardous and non-hazardous liquids, solids, and semi-solids. Following use, caged IBCs are then typically recycled to be cleaned, reconditioned, or rebottled. 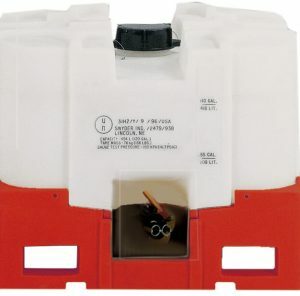 Standard totes have 6″ threaded fill ports, 2″ bottom drain ball valves, and feature 2″ male quick disconnects. 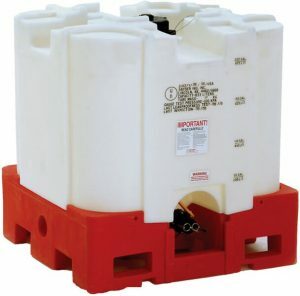 Square stackable IBC tanks are portable, reusable, basic bulk handling containers. They are rotationally molded from quality high density polyethylene to applicable FDA, ANSI/NSF 61, UN/DOT Title 49 CFR requirements and specifications for consumables, potable water, and Packing Group II and III hazardous and non-hazardous materials. 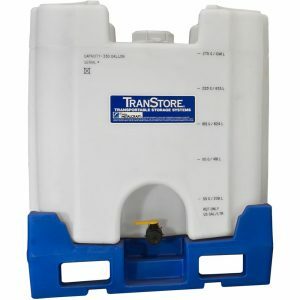 Square stackables are offered from 120 to 330 gallon capacities. 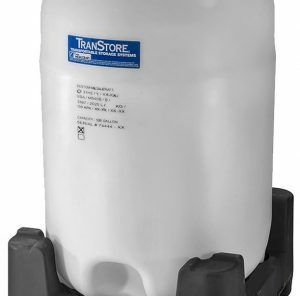 All are rated to 1.9 specific gravity and roto molded to 1/2″ thick HDPE, making these IBCs capable of long term handling of corrosives and heavy commodities. A rotationally molded 1/2″ thick exterior eliminates seam weak points, promotes product service life and durability, and makes IBC containers reusable for hundreds of trips. 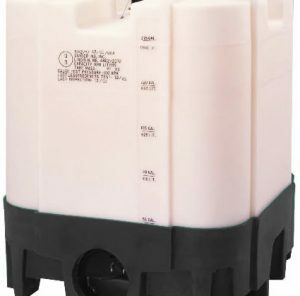 This IBC type is available in standard, premium, and wide mouth models to the same gallon capacities and specific gravity ratings. Standard square stackable IBCs feature a heavy duty, standard black base that gives 30% greater protection of the tank bottom. This heavy duty base features increased width forklift channels, is easier, less expensive to replace, and also reduces the overall height of the IBC. The standard base has four way forklift and two way pallet jack access. Standard base color is black. Different color bases can be fabricated if requested. 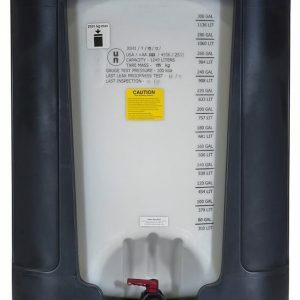 Standard square IBCs feature a unique, ribbed top designed to promote vertical stacking alignment and protect the tank’s top ports from potential damage. 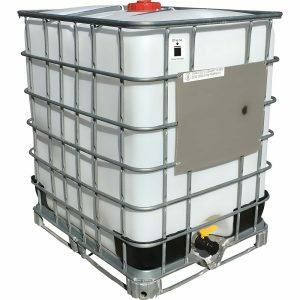 Standard components and features for square stackable IBCs include a 6″ heavy duty screw cap lid fitted with a security tether, one or two 2″ bungs, a 2″ integrated pressure release vent, a 2″ male bottom drain camlock, and gallonage markers. 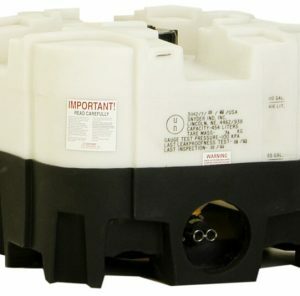 Premium model square stackable IBC tanks are manufactured with all the standard square IBC model features. 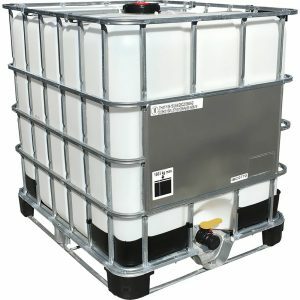 The difference between the two is in available tank customization and the IBC pallet base. The premium square stackable model allows for additional tank fitting customization and fabrication options that are not offered with the standard model. Premium model bases are molded with safety forklift channels and red in color unless otherwise requested. 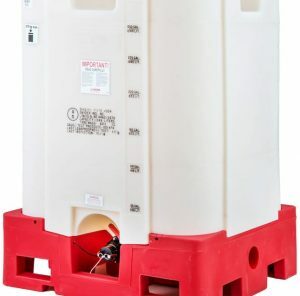 Wide mouth model square stackable IBCs are manufactured as premium model square stackable IBCs with similar customization options but includes an 18″ wide manway opening. This extra wide top port provides internal access for cleaning, drying, sanitization, as well as for mixing, blending, and stirring operations. Wide mouth stackable IBC totes promote complete product drainage through fully sloped tank bottoms and 2″ full port ball valves. The wide mouth square stackable has design features that make them applicable and heavily utilized in paints, adhesives, coatings, traffic marking, line stripping, inks, dyes, chemicals, lubricants, pharmaceuticals, and in the food and beverage industry for syrups, wines, and spirits. Wide mouth tote models come with a polyethylene lid and sanitary clamp ring and gasket closure. 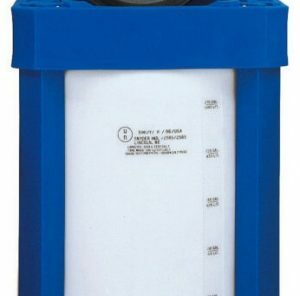 Similar to the other square stackable models, the wide mouth models feature a 2″ replaceable bung and gasket, 2″ gasketed automatic venting relief, and 2″ full drain valve. EPDM gaskets are standard. Wide mouth models are manufactured with the premium base, but the heavy duty base model can be requested for fabrication. Intermediate bulk containers possess various characteristics that contribute to their usefulness across industries and applications. IBCs provide a consistent cargo packaging that is manufactured and specified to federal regulations and current industry technology. 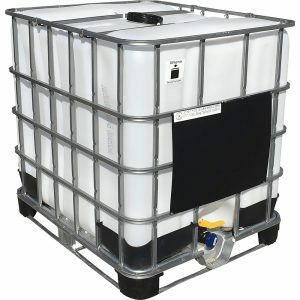 All except caged polyethylene IBCs are designed to be extensively reused. 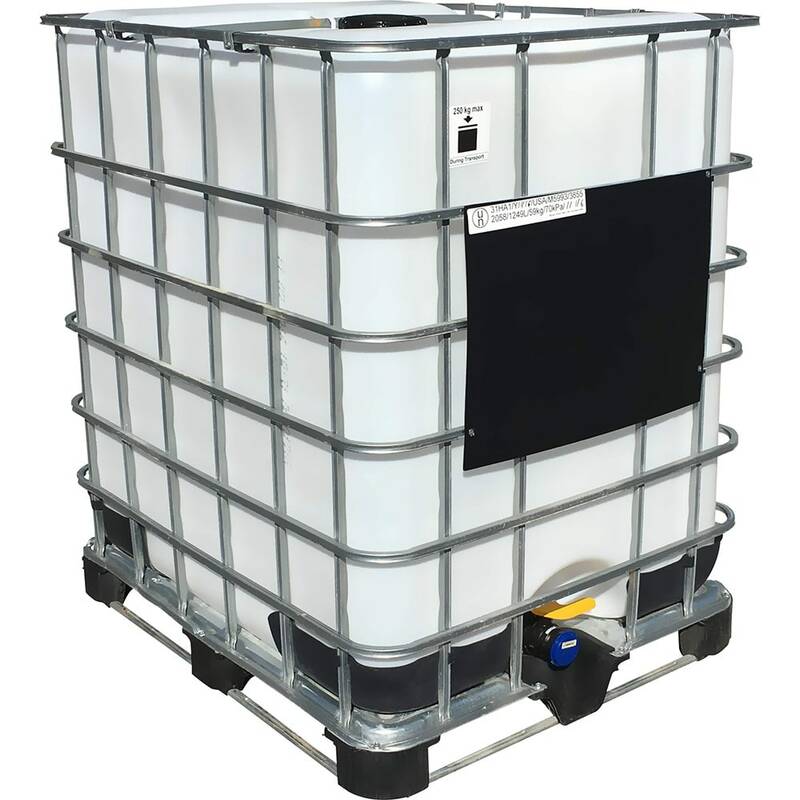 Most IBC totes are highly reusable and have long service lives, making them very cost effective assets. All IBCs are cube shaped and all but Megatainers are sized to or near standard pallet dimensions. This allows for more material to be transported within similar dimensions while maintaining effective and familiar mobility. IBC totes have either two way or four way forklift, pallet jack channels that allows increased maneuverability by providing multi-directional approach. All IBCs are stackable. The stackable design promotes efficient handling, storing, and transport, and allows for gravity-based product dispensing as well as other system integration applications. IBC tanks are durable and easy to fill, stack, and load. They are resilient against impact, tearing, and against easy puncturing. 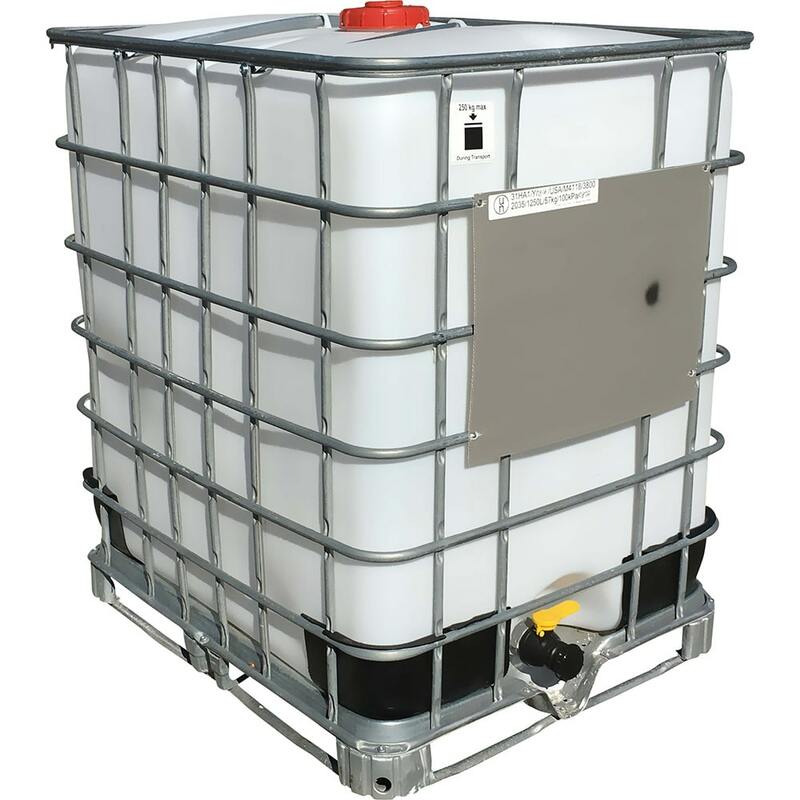 Polyethylene and metal IBCs resist the corrosive effects of many materials and chemicals. Metal IBCs are ideally suited for flammable, combustible materials, exposure to high temperatures, and strict hygiene and cleanliness applications. 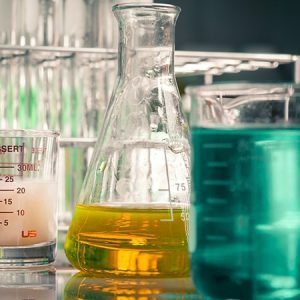 All our offered IBCs are UN/DOT approved for handling hazardous materials such as corrosives, acids, and caustics as well as approved for land and sea transport. All IBCs can withstand typical transport pressure and stress with automatic vacuum vents that self-operate when internal pressures begin to reach 0.25 PSIG. Materials can be stored and handled with limited risk and waste. IBC inflow and outflow engineering promotes zero waste from spillage or overflow. Intermediate bulk containers provide numerous benefits to suppliers, distributors, end users, wholesalers, and transporters. They have many characteristics that make their use beneficial to company economics and logistics. IBCs are well suited for industries and companies that are dependent on the secure packaging and arrival of their product. Products can be effectively moved through long, complex supply chains and can be safely and easily warehoused. Long term storage and transport can be accomplished without neither the cargo freight nor the IBC depreciating in quality and quantity standards. Time and money can be saved through reusing IBC containers for specific applications, potentially replacing large quantities of drums. A 350 gallon IBC tank is the equivalent of six 55 gallon drums, fits to one pallet size, and handled by one forklift. One IBC can potentially make hundreds of successful trips. These qualities contribute to reduced physical waste and disposal costs. IBCs are recyclable, reducing environmental impact at service life end. IBC Tanks provides the greatest selection of intermediate bulk containers offered at industry competitive pricing and manufactured utilizing modern industry technology. We have a full section of IBC tote fittings and accessories. Contact us for your IBC tank questions, for custom fabrication options, or for any assistance you may need. Bulk pricing is available for multi-quantity orders.